MCG is the non-invasive new test device for ischemia. 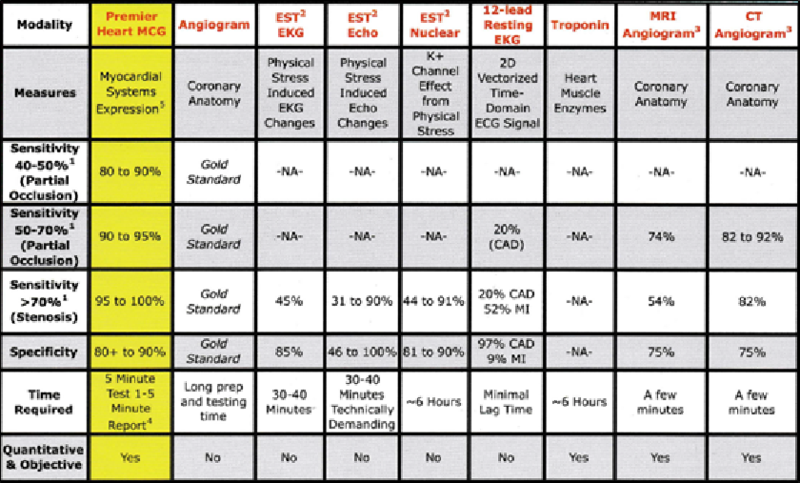 MCG stands for “Multi- function CardioGram“. 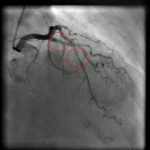 MCG analyzes abnormality of heart (mainly ischemic heart disease) by its AI. MCG compares the patient’s ECG data with the 40,000 people’s clinical data bases. 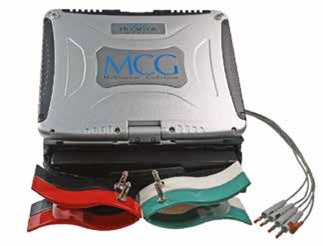 MCG is a non-invasive with high accuracy ECG test device. It can be used safely without any harm to the patient. 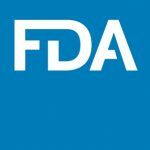 MCG was developed in the USA, and approved FDA(510k) and acquired CPT insurance code. In contrast for MCG, you don’t need to read such graph. The ECG waveform is transformed in frequency domain and it is automatically analyzed by AI with 40,000 clinical database. For details pleaes see below. Ischemic heart disease(IHD) is the No.1 cause of death in the world. It suddenly causes myocardial infarction without symptoms, and in some cases, it leads to death in the worst case. 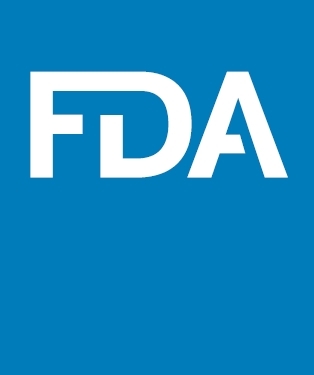 The tests currently used are low accuracy, or needs invasion such as passing a catheter through the body. Further, such invasive tests are expensive and should be performed under the skillful doctors and expensive equipment. These are considered to be the reason why heart disease is the No.1 cause of death in the world. Functional ischemia is the condition where heart muscle is less active mainly due to the supply of oxygen is insufficient by stenosis of large vessel. 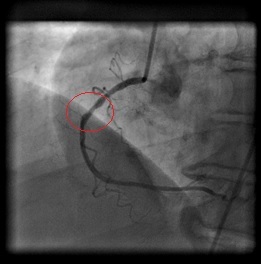 The stenosis can be found by CAG(Coronary Angiogram). However, it is told that the structural ischemia is not always functional ischemia. It is told that the blood flow of the coronary artery is said to be about 20% of the whole heart. Further, the decrease of activity in cardiac muscle cell may be caused by various cases, such as cases where blood flow can not be secured sufficiently due to abnormality in valve function, deterioration of cell function due to aging, inflammation or stress, etc. In addition, the bad result of blood test does not always cause abnormalities of the heart. Since the object of each test is different in this way, it is not considered that only one gold standard test can detect all the abnormal condition. MCG contributes to comprehensive medical diagnosis as a tool providing one of the variety of aspects of the patient’s condition by analyzing the activity of the heart cell. Useful for AI based preventive medication. When heart muscle(or each heart cell) act, the electricity known as “Action potential” is generated and the sum of action potential configure the Electrocardiogram(ECG). When the activity of heart cell is changed, action potential is changed. And ECG shows abnormal waveforms in severe case. Functional ischemia is the condition where heart muscle is less active, where action potential is also considered to be “less active”. MCG is the new technology to detect the activity of action potential in frequency level. In frequency level, the slight change of the component of electricity can be detected which can not be recognized by ordinal ECG. 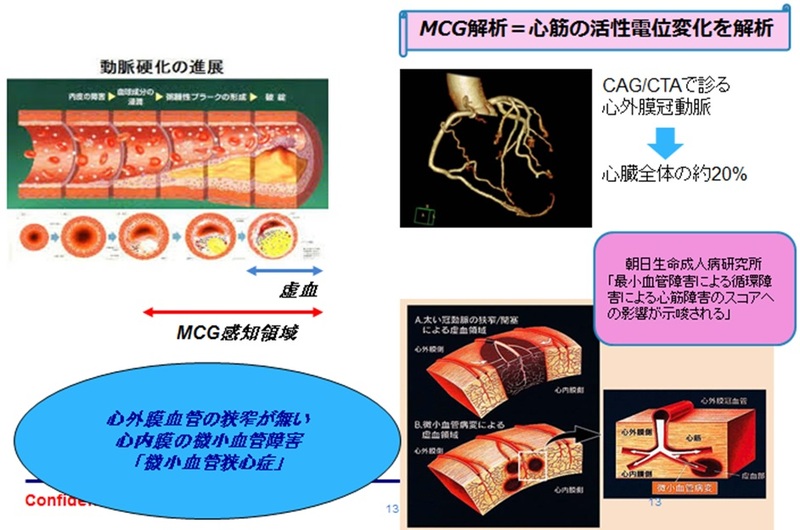 In this way, MCG analyzes the condition of myocardial cell, and shows the severity of the abnormality of myocardial cell caused by these type of disease. the most valued benefit of MCG is “non-invasive” (not damaging the patient’s body) with high accuracy. then there are possibility that causing anemia or syncope. Also, some of the patients can not take this test because of joint pain etc. In CT and scintigraphy, they are high accurate tests, but there is a problem of radiation exposure. Further, for using contrast agent, there is invasion such as injection of a contrast medium. Also, there are some patients with contrast contraindication. Examination using catheter such as coronary angiography involves invasion such as injection of a contrast medium by injection and passage of a catheter from a wrist or foot vessel. In this manner, various tests related to the heart disease differ in terms of disease condition, invasiveness, and accuracy. Among such tests, MCG is the test which is non-invasive and high accuracy examining cardiac muscle cell activity through electricity of the heart. Information (except MCG data) from: Cleveland Clinic Intensive Cardiology Review Course, 2001.MCG Data from: Premier Heart Clinical Trials. by taking advantage of the AI technologies which have not been applied to use for clinical diagnosis so far. The technology has the following three features -(1)frequency analysis, (2)algorithm by AI, and (3)database matching. The frequency analysis technology is mainly used in mechanical engineering and acoustic engineering. For example, in non-destructive inspection of tunnels, the abnormality of the structure is inspected by hammering the walls of the tunnel and grasping the difference of the frequeny structures of the sounds of its acoustic echos. Also, when poultry farmers ship raw eggs to the whole sale markets, their inspecting machine gently hits the eggs and grasp the difference of the frequenycy structures of its acoustic echos of invisible cracks. 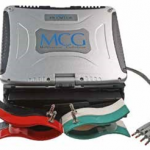 MCG is a technology that uses such technology for electrocardiography. · In addition, frequency-based technology has already been used for biological information such as EMG and electroencephalograph. 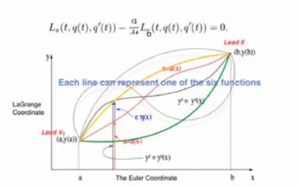 The MCG algorithm defines the relations between the characteristics of the frequency level and diseases. In MCG, we compare differences such as time lag, composition, and relationship between two leads of ECG(V5 and II lead) in frequency level, and hold such characteristics as 166 indexes. In MCG, we also grasp these differences found in normal and abnormal people,and forming it in algorithm. Through the researches over the past 30 years, Premier Heart formed the existence and combination of the index for diseases and systematized them as an AI based algorithm. MCG holds approximately 40,000 clinical database including healthy people and patients with diseases. The database consists of males and females from 14 years old to 100 years old. 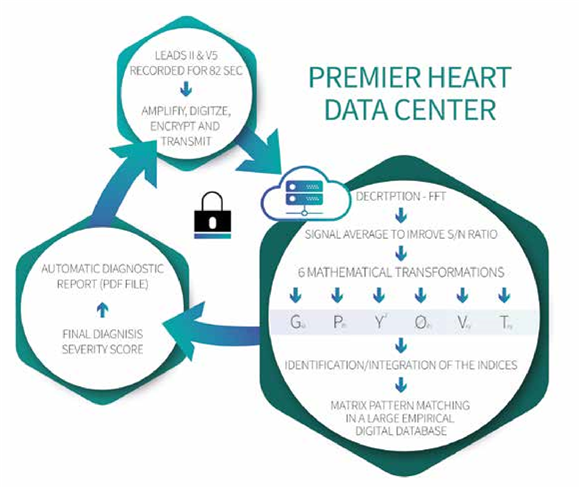 The MCG system matches an ECG acquired from a patient with the database, analyzes the severity of the disease by its AI and reports the results. We decided to explore new ways to analyze ECG signals based on Professor Norbert Weiner’s Cybernetics Theory. Instead of the usual process of analyzing each conventional EKG signal as a single vector, MCG Technology adopts mathematics principals of Eüler and LaGrange Coordinates expressed via Lagrangian Mechanics to explore the interactions and communication between two EKG signal sources, Lead V5 and Lead II, via multiple non-linear functions. We believe that this is the best, most rational, method to understand the physics of the extremely complicated and dynamic relationship between the heart muscle and blood flow throughout the cardiovascular system. Our discovery has proven that the non-linear mathematical transformations of a pair of digitized resting electrical signals (Lead V5 and Lead II) can express a plethora of never before seen information embedded between these two signal sources, completely unavailable to the conventional ECG waveform analysis. These were discovered empirically from large volumes of digitized EKG signal data recorded from both animals and humans. This new, generative discovery opens up an entirely unprecedented path that allows our team to explore hidden dimensions of the cardiovascular system in a new domain of discipline we call: Computational Electrophysiology.